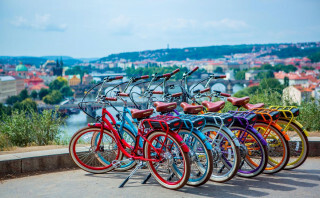 Our most popular Prague electric bike tour. 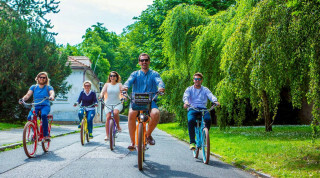 Enjoy all of Prague’s most significant locations, sights and buildings in a fun and active way. Scheduled tours run every day at 10:00 a.m. and 2:00 p.m.
We limit tours to 8 people. In case there are more people, we split the tour between 2 guides so the tour can be more enjoyable and all questions are answered with full attention and quality. We pay special care and attention to kids. A child's seat is free for kids from 0-3 years up to 23 kg. For kids over 7 years old, we have a special electric bike for kids called FISHKUS. For kids over 10 years old, we offer a smaller type of electric bike. The system we use is called PEDELEC and it helps you when pedaling. This means that when you don't peddle, the motor doesn't help you. So if you know how to ride a normal bike, you are going to enjoy e-bikes for sure. It is a fun and a new way how to discover bigger part of a city without a drop of sweat. Your booking will become valid after we receive your payment and send you a confirmation voucher. The payment is fully refundable if you cancel until 24 hours before the tour. For later cancellations there is no refund. 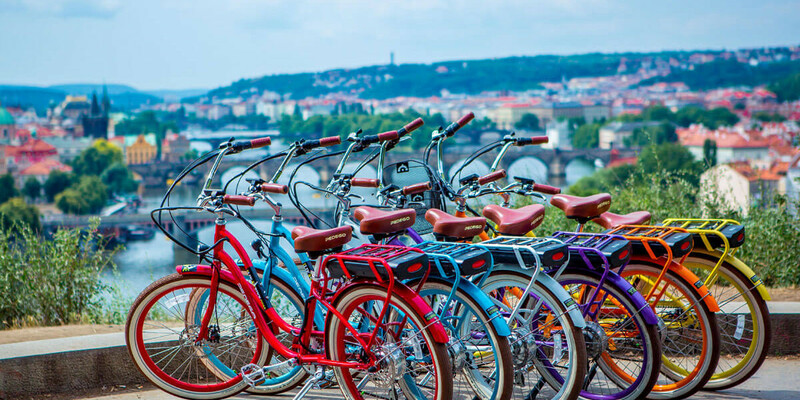 Cruising on high-end and stylish eBikes, we visit over 30 of Prague’s most noteworthy places. On our “Viewpoint Tour,” our most popular option, you discover Prague’s center and outer areas in the fresh air without breaking a sweat. Experience the famous square where the communist era ended and Velvet Revolution took place. Admire the modern curves of the Dancing House, Prague’s cubist gem. Cruise the promenade along the Vltava River where locals spend their free time and listen to live music performances. With us, you explore 7 districts of Prague and 7 magical vantage points. Some places are famous landmarks and others are a bit more under the radar. Along the way, we make one stop for refreshments in the largest beer garden of Prague. We use top-notch e-bikes, each with its own name according to famous personalities from our history. The motor helps you when you peddle, making it an accessible ride for those with little bike experience or some limitation. Everyone has the same speed so don’t worry about catching up with other riders. For each trip, the greatest emphasis is not just on quality electric bikes but also on our excellent, friendly guides. They connect the past to the present through all the milestones of our nation and tell insightful, historical stories. Get to know Prague’s history and culture filled center. Cover all the ground you need with our e-bikes and have fun falling in love with this gorgeous city.